Perhaps the most helpful exercise in understanding the real meaning of the soul is going out into nature. The teachings of the nature path run directly counter to the teachings of our culture. In our society, we deny death, we deny aging. We try to close our eyes to decay, degradation, and the end. We try to make good states last forever and bad states stay away forever. In nature, it is nothing like this. The dead branches lie comfortably among the live grass. The rocks sit among the frogs. The inanimate dirt plays easily with the hopping rabbits. All that is alive and all that is dead co-exist. There is no sweeping death or decay under the rug. Some things are living and others are dying. This, however, does not change the life energy within the forest. Things continue to grow because other things have died and these same things die because other things have lived. This is a comfortable and natural process. In nature, all that is temporary allows itself to be temporary without resistance. Behind each temporary form, such as an individual flower or a single bee, there is a steady, constant supply of life energy. This, and only this, is eternal. All else births and dies. At first glance, this truth seems depressing. At first experience, however, it is the most beautiful thing. Since the soul, the permanent self resides within, it does not need to be earned. It is within regardless. It cannot be removed, created, or built. It is there, awaiting your acceptance just like a thirsty tree awaits your acceptance that it is a tree. Of course, it is not the acceptance itself that is being awaited; it is water for the tree and love for you. However, in order to know what to give, you must first know the nature of your recipient. Loving oneself is akin to raising oneself. Once you know what you need, you can get into nourishing rituals. Discovering the truth of who you are is the only way to love and care for yourself. When we see ourselves as infinite, all questions of deserving disappear. In our shame-filled society, we ask: do I deserve to be loved? Do I deserve to be accepted, cherished, or admired? When we look at ourselves through the permanent self, these questions seem silly. They seem as silly as asking – do I deserve to eat? Does a flower deserve sunshine? Does a bee deserve pollen? If I am, at the core, an essential part of the ever-present unity, how can I not deserve to be united? How can I not deserve to be something that I already am? My external self, then, is my creation and my art project. It is my work and my play. It is my legacy and my show. It is my child that needs feeding and my house that needs decorating. It is not, however, my home. It is not my identity. It is not my true self. It is a necessity, yes, but it will never be stable. The child will leave the nest. The best paint job will crack. The best play will become boring. The best work will grow tedious. The best art will lose meaning. The greatest creation will decay. Behind all this, lies my true self. With this, I can do anything. This is the difference between a starving artist who is told to paint a very specific picture to get his next meal and a well-fed artist who paints because he is passionate about painting. This is what life becomes when we find our true home, when we open the gates of our minds and come into the feast of love within. There is no need to search for peace or happiness anywhere except for inside ourselves. With this, we gain the most sensational courage. We can do anything and be anyone. We can risk who we are right now for the possibility of experiencing something else tomorrow. We can sing out loud and speak our minds. We can do anything we truly de-sire, because there is no more need for fear. Ironically, once you focus away from trying to find your individuality and put your attention towards unity, your individuality will emerge. If I simply feed my roots thoughts of love, over time, I will find out what sort of tree I am to be here in this moment, in this body. This is a beautiful realization, but it is not my job. My job is just to water my roots and come out into the sun. All else flows effortlessly. It is not my job to criticize my external form or to deprive myself of nourishment. It is not my job to judge or punish. My job, my only job here in this moment, is to love myself and, by extension, to love others. My job is just to live and to realize that to live is to love. Even if I do not do my job, my essence will not change. If I fail to learn how to live, how to love, my external form will perish while my inner essence will live on in some other form. I cannot be broken. I cannot be killed. I cannot fail. This is my identity. This is my core. I am infinite. I am permanent. I am unbreakable. There are other things that I’m told define me, but I am not attached to them. I may be told that I am attractive, but I do not make it part of my identity. I know that sexual attractiveness fades and I will not fade. I may be told that I am smart, but I do not make it part of my identity. I know that smart is just a word and that intelligence is not something fixed, but rather a process of learning from the world. Smart is not infinite. Growing is infinite. I may seek to learn and grow, but I will not make “smart” a part of my identity. I may be told that I’m stupid, ugly, worthless, fat, annoying, wrong, or bad. I do not make these a part of my identity either. They are not permanent, not infinite, and not true. They are simply judgments that others have made of me because that is how they judge themselves. I know that, as William Blake said, “If a thing loves, it is infinite.” And that’s me. I am infinite. I am loving. But, above all, I am always loved. Vironika Tugaleva is an author, speaker, people lover, reformed cynic, and a different kind of spiritual teacher. She helps people heal their minds and discover their inner strength. 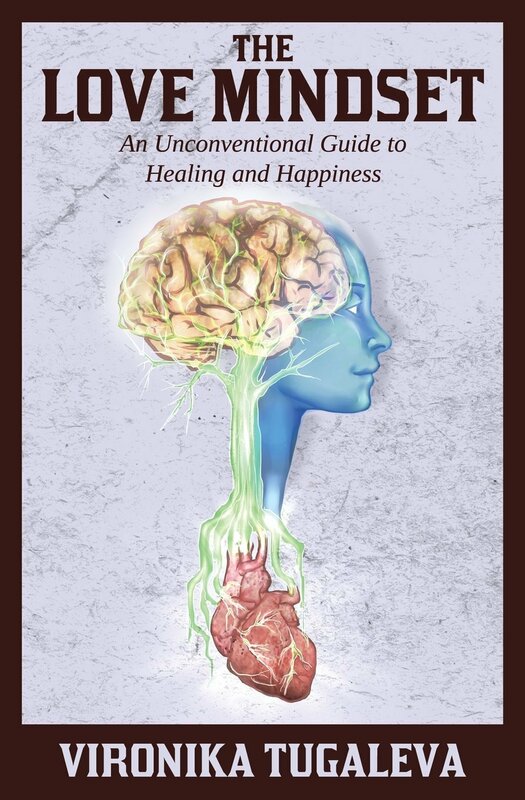 You’re invited to read more about Vironika and her inspiring book The Love Mindset.